in the body. It is, therefore, prone to dislocation. These types of injuries are commonly seen in football players, skiers and surfers, and can also occur after a simple fall or reaching out to catch a ball. 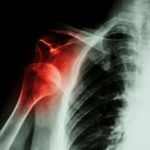 The shoulder can dislocate either temporarily, where it quickly relocates by itself with movement, or can remain dislocated in which case it needs to be re-located by a Doctor or Physiotherapist who is experienced in this area. These episodes can be extremely painful, but often settle very quickly, leading to people thinking that not too much damage has occurred. During both types of dislocation, the soft tissues around the joint are stretched beyond their normal limits and remain loose for some time. The risk of repeated dislocations is subsequently very high – reportedly up to 90% in some populations for up to 12 months. The shoulder joint is classified as a ball (arm bone or humerus) and socket (shoulder blade or scapula) joint. With each dislocation, the risk of fracture of the “ball” part of the joint increases. This is called a Hill-Sachs fracture, and it is caused by the “ball” section of the joint slamming into the “socket” part of the joint. You can also damage the “socket” in the same way, and this is called a Bankart lesion, where the cartilage is damaged making the joint even less stable and causing more dislocations. These types of injuries predispose the person to developing arthritis later in life. The good news is, with a comprehensive shoulder strengthening program guided by our experienced Physiotherapists at Aushealth Physiotherapy, this risk can be reduced. Often we run these programs with the input from Shoulder Orthopedic Surgeons to ensure that our patients get the best results. The exercise program is done in stages, starting with very gentle exercises and progressing to more and more difficult exercises over time. So, if you have had a shoulder dislocation (or any shoulder injury for that matter), and you haven’t had it checked out by a Physio or you aren’t happy with how your shoulder is feeling right now, give us a call on 99050048 or click here to organize an appointment and get in control of your shoulder.